May Discounts on the Yampa River! 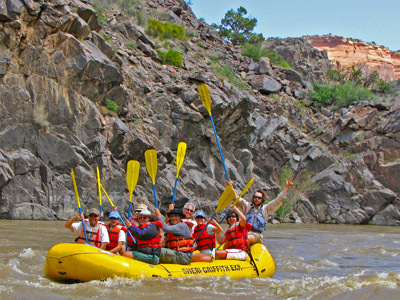 Get $100 off any May Untamed Yampa River trip if you book before March 31. The Yampa River through the Dinosaur National Monument has it all! As the last free-flowing river in the entire Colorado River drainage, the Yampa River is incredibly wild in May. The Rocky Mountain spring run off creates big roaring rapids with an average descent of 14 feet per mile. This year marks the 75th anniversary of The Yampa River and her canyons addition to Dinosaur National Monument. Last summer a large rockfall changed the dynamics of the Yampa's biggest rapid, Warm Springs. 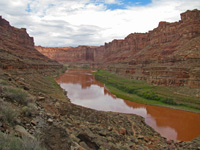 We are excited for the opportunity to traverse this new challenging route, 2013 is THE year to see the Yampa! Book Online and enter Yampa100 to receive your discount. The contrast between the rugged nature of the river and the evening comforts of a moving hotel is the perfect way to enjoy the outdoors. 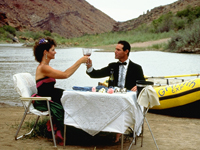 The scenery in Westwater Canyon is breathtaking, the rapids dazzling, and the hikes soul stirring. And it’s your vacation. The guides, the chef and camp attendants will do all the work. The multi-faceted 12 Day: John Wesley Powell Adventure combines magnificent wonder, spectacular whitewater challenge and triumphant personal achievement. It is the ideal balance of serenity, thrill and fascination that will transform your life.